If you can’t take the heat then you better get out of my kitchen, because I love my peppers. I love them hot, sweet, roasted, dried, flaked, fresh, ground, stuffed, sauteed or sauced. In fact, one of the first adventurous dishes I ever made was a very bueno chile relleno (stuffed pepper). I was so proud. These days I am almost completely helpless without my favorite jar of hot, smoked, flaked red pepper, called Controne. I use it in almost everything I cook. Peppers are plants with the scientific name Capsicum Annuum. They have a lineage that comes from the dark side, an intriguing family called “nightshades.” Although they sound scary, you don’t have to fear them. They are also your great protector, powering the “capsaicin” ingredient in your self-defense canister of pepper spray. Peppers aren’t all drama. Some of the more innocent members of its very same family are potatoes, eggplants and even tomatoes. 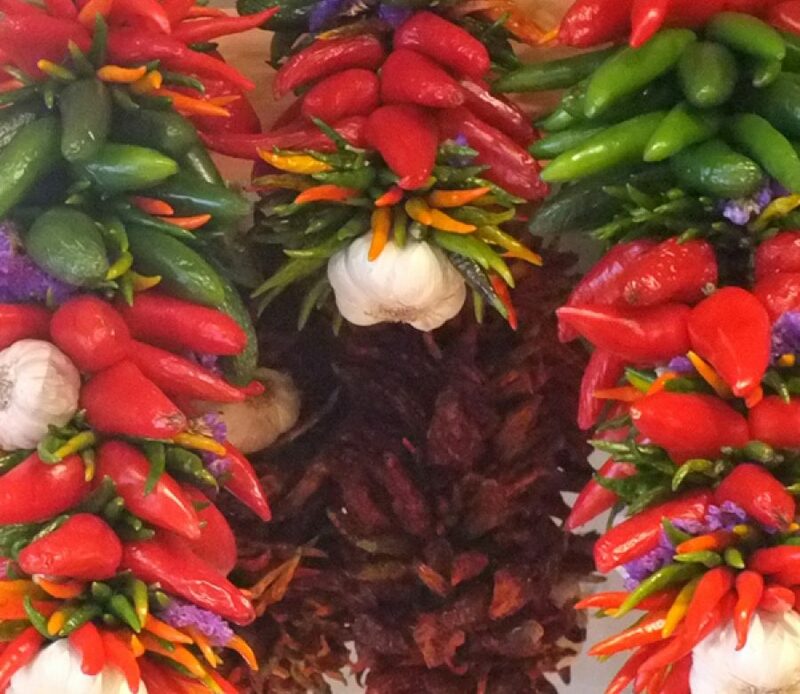 Peppers come in many sizes and brilliant colors and can vary from hot, like jalapenos, to not, like sweet bell peppers. Although they vary in heat, the best news is that they are all delicious and different in their own way. In fact all these shady pepper guys are do-gooders at heart because they are anti-inflammatory, anti-oxidant vegetables. That means that when you eat them they will help reduce inflammation in your body. Why is that important? Inflammation is the greatest villain our bodies encounter so get your pepper spray ready and defend yourself! There are two kinds of inflammation we experience, acute and chronic. When you fall down and skin your knee the acute inflammatory response from your body’s immune system is a good thing. It initiates a very targeted, laser-like process of healing, then it’s over. Chronic inflammation on the other hand is like that same immune laser — gone over to the dark side, completely out of control, constantly firing and causing cellular chaos. It ignites an ongoing, low grade “burn” of inflammation in the body which plays a strong role in a slow deteriorating process, which eventually results in a myriad of possible disease states such as arthritis, heart-disease, diabetes, dementia, cancer and many more. We all want to avoid those troubles! So for combat we should consider including peppers in our diet. It is a really delicious idea. In fact to get you started, Chef Jeremy has shared some of his best tips on how to find the freshest peppers at your market. Check out some delicious Salty’s signature renditions: Oregon Bay Shrimp-Stuffed Avocado with Chili Coulis and Sea Salt-Crusted Prawns with Pico de Gallo and Flame on! Read more about bell peppers at whfoods.com.